**CALL FOR LOWER PRICING ON ALL JUROPS This pump is for 1,000 - 2,500 Gallon Tank Standard Duty Applications. With 317 CFM, Forced Oil Lubrication with built-in resevoir and features Heat Resistant Kevlar Vanes. **CALL FOR LOWER PRICING ON ALL JUROPS This pump is for 1,000 - 2,500 Gallon Tank Standard Duty Applications. With 230 CFM, Forced Oil Lubrication with built-in resevoir and features Heat Resistant Kevlar Vanes. **CALL FOR LOWER PRICING ON ALL JUROPS This Pump is for 0 - 1,000 Gallon tank Standard Duty applications. With Forced Oil Lubrication it has a built-in reservoir.
.**CALL FOR LOWER PRICING ON ALL JUROPS This pump is for 2000 - 6000 Gallon Tank Heavy Duty Applications. Automatic Lubrication, Continuous Duty Pumping at 18", Ballast Port Cooling, Heat Resistant Kevlar Vanes, and a built in Oil Reservoir. **CALL FOR LOWER PRICING ON ALL JUROPS Knocks out tough Jobs, no job too Tough! 300 CFM Continuous Duty at Deep Vacuum, 27" Max Vacuum, 28PSI Pressure, 3" Fittings, Water Cooled from truck engine which requires no auxiliary cooling system, automatic oil lubrication, built in final filter, and one year warranty. Jurop PN23 Vacuum Pump and Starter Package. 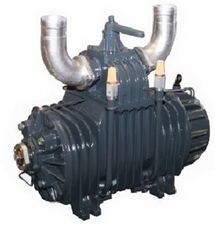 Includes PN23 pump, mounting stand, aluminum auto align bracket, 3 shaft gear box, pump coupling, horizontal secondary, final filter with reusable 55 mesh filter, vacuum pressure tree [vacuum relief, pressure relief, vacuum gauge] sand blasted and powder coated black finish. **CALL FOR LOWER PRICING ON ALL JUROPS Knocks out tough Jobs, no job too Tough! 425 CFM Continuous Duty at Deep Vacuum, 27" Max Vacuum, 29 PSI Pressure, 3" Fittings, Water Cooled from truck engine which requires no auxiliary cooling system, automatic oil lubrication, built in final filter, and one year warranty.